Found 5 file extension associations related to Sage 50 Accounting and 5 file formats developed specifically for use with Sage 50 Accounting. 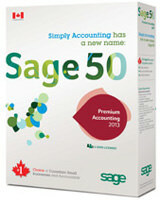 Sage 50 Accounting (formerly Simply Accounting) is an easy-to-use accounting and business management software that provides you with the tools you need to manage your financial transactions and streamline operations. Sage 50 Accounting allows you to understand your customers, expenses and cash flow so that you can better run and build your small business. With a diverse line of accounting solutions, Sage 50 Accounting is supported for both English and French application, so you can focus on what you do best. If you need more information please contact the developers of Sage 50 Accounting (The Sage Group plc), or check out their product website.